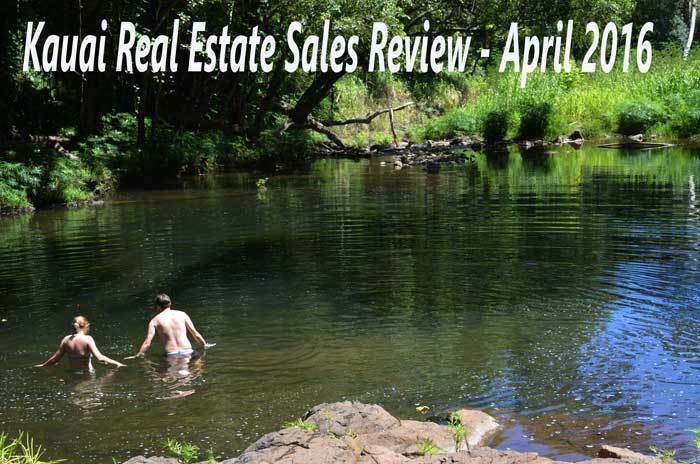 April was an active month for Kauai real estate sales with 46 residential properties selling for a median price of $543,000. An increase of almost 22 % in number of units sold but a decrease of nearly $9000 in median sales price when compared with same month last sales in 2015. The good news is that people are feeling more confident in this upturned economic cycle and want to lock in to these historically low interest rates. Presently sitting at 3.8% for a 30 year fixed as listed by Bank Rate. Here is the April 2016 residential home sales by district and number of units sold. All numbers are deemed accurate and presented by Hawaii Information Service. The Kauai land sales in April continued a similar pattern as in residential sales with an almost 50% increase in the number of units sold island wide but a 30% decrease in median sales price when compared to the same month last year. The hope is that with new land ownership there could be a continued upswing in our local construction industry. Most general contractors I have spoken with are telling us that they have a backlog of 6 to 12 months in their schedules before they can break ground for clients. Presented here graphically is the Kauai land sales for April by district. Kauai condo transactions rose significantly in April when compared to last years numbers with 32 closings compared to 25 in April 2015. Median price decreased to $301, 000 compared to $385,000 this time last year. Koloa district led the way in sales volume and number of units sold with the majority of transactions in the condo dense Poipu region. Here is how sales ranked by district in April. Lee Morey, is the Principal Broker and owner of Coldwell Banker Turtle Cove Realty in Kalaheo, Kauai. Her Kauai real estate sales review is produced with the data provided by the Hawaii Information Service. Lee, writes frequently about Kauai real estate, Kauai vacation rentals, and all matters that affect our island. She can be found on line and at 808-651-6720.